Following his impressive performance against Cardiff, Arsenal striker Alexandre Lacazette has called for new manager Unai Emery to keep him as a mainstay in the Gunners’ starting lineup. Lacazette was very impressive this afternoon – scoring the winner in Arsenal’s 3-2 victory over a very resilient Cardiff City side. 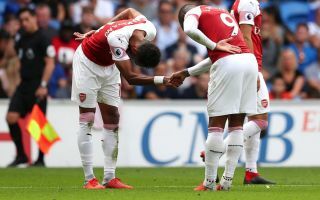 The France international impressed fans with his on-field chemistry and link up play alongside superstar Pierre-Emerick Aubameyang, assisting his strike partner for the club’s second goal of the afternoon. Gooners went on to coin the nickname ‘Lacabameyang’ for their emerging strike duo after being wowed by how they combined together. Alexandre Lacazette: "For me, it was important to start well. I wnated to show to the coach I can be in the first 11, and we played well today so I'm happy. We saw some highlights from the goalkeeper, and I knew if I shot with a lot of power I could score so I did!" Fans will hope he has done enough to persuade Emery to play him from the start more, ,as he looked very sharp this afternoon and was a key part of what was a very impressive attacking display from Arsenal. Although Arsenal seem to be a broken record of sorts as of late with their attacking efforts once again undermined by another poor defensive showing from Emery’s men. A narrow win thanks to a late goal from Lacazette was by no means the statement Arsenal should be looking to make. To highlight Arsenal’s defensive dismay as of late Neil Warnock’s Cardiff scored their only two goals of their Premier League campaign so far against the Gunners today. With Lacazette showcasing what he adds to the starting lineup this afternoon – the Frenchman’s second season at the Emirates could prove to be a very fruitful one.